French toast always brings back memories of my former home. I used to get so excited when my mom would make a simple piece of french toast (regular white toast + common egg/cinnamon mixture) in the mornings for breakfast. Ever since those times, french toast has only existed at restaurants. Because I spent some time in Dallas visiting family these past few weeks, my cousin and I decided to host a breakfast one Saturday morning. 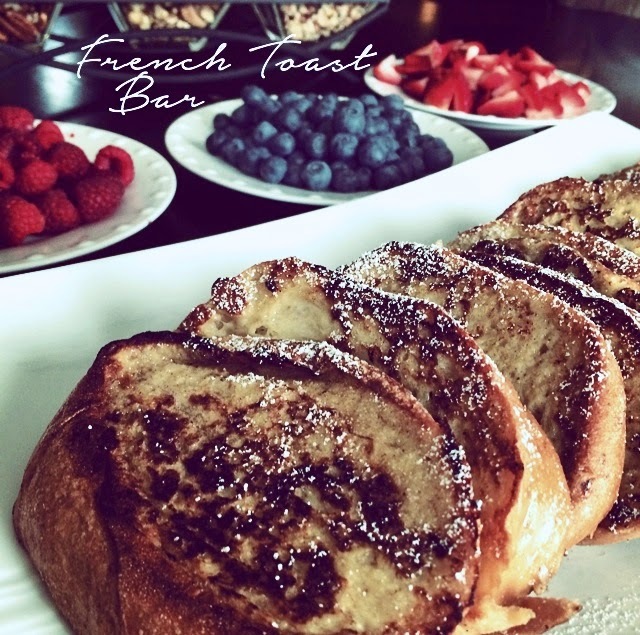 To deviate from our normal routine of an arabic breakfast, we figured we would try something new and create a french toast bar. The recipe was simple, and the idea of a bar was like fulfilling any childhood dream. I started off with this recipe and made a few alterations considering the lack of access to ingredients + preferred taste. I also tailored it make 8 servings. It's always preferred to use a thicker bread (like Challah or brioche), but unfortunately we couldn't find either of those at our local Walmart. We ended up using day-old french bread & it worked out just fine. However, I highly recommend toasting the pieces of bread before dipping into the egg mixture. If not, you'll get very soaked pieces & will lack the perfection of crisp on the outside with a soft center. with a few tablespoons of butter. Start the cooking process until the toast is golden brown. Add more butter when necessary. For the toppings we chose an assortment of fruits and nuts. Make sure to toast the nuts in the oven for about 3-5 minutes so that the oils are released and the flavor is exaggerated. (We used pecans, walnuts, and hazelnuts). I don't think we will be using thin sliced white toast anymore.